So I headed to the Safeway this weekend to buy groceries for the week. According to my financial planner, I should only be spending $150 – $200 on groceries per month. I went to see if it was possible, and frankly, I don’t think it is. First, I used my Safeway app on my phone to apply coupons to anything that I was planning to buy that was on their list. That saved me a whopping $2.13. Then, I went through the store and bought 20 food items and 3 birthday cards – some of which were on the club card savings. AND, there was no meat, no wine, and no household products either, mind you. 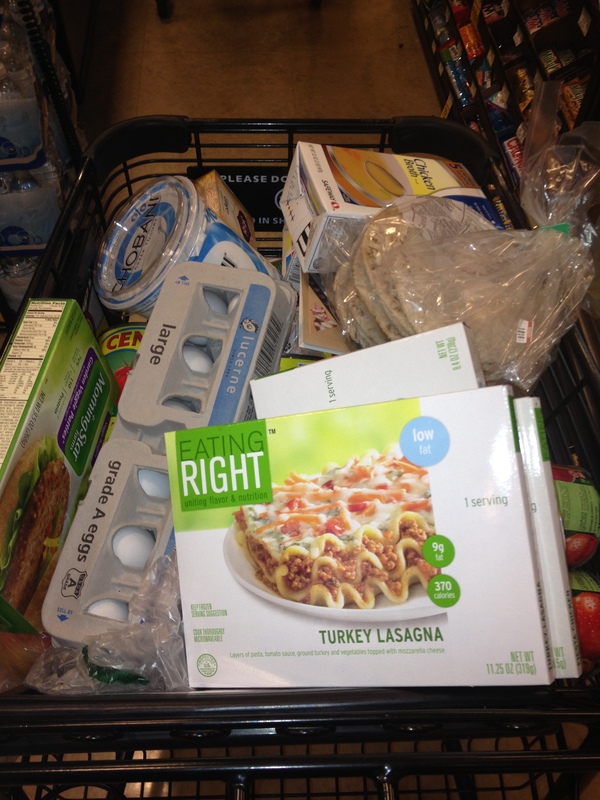 This is my measly cart. And for all of this effort, my stuff STILL cost $75.44 – half of my costs for the month. I usually get 2 boxes from a local CSA each month. Those are $30 a piece, so basically that taps out my monthly budget. I’m going to have to get real creative to make this stuff last – I think I have some chicken in the fridge. But I don’t know how to make this last – and, seriously, I cannot live without meat or wine. It’s just not possible. Is there a cheaper grocery store anywhere in D.C.? Does anyone know how to game the system?? Hi DCDiscountess! I feel your pain: need food to live, but have said budget earmarked for more fun things such as shoes, etc. How about Trader Joe’s for more frozen stuff. Get all the fresh stuff via your CSA (or maybe scrap that altogether – so much $$). I know you do a mean chili, so maybe start making batches of meals that can be frozen. (this from the gal that shops for groceries at CVS!) But that’s my 2 cents. Love your blog! Heather S– you took the suggestion out of my mouth! DC Discountress, it’s time to fire up the chili! Or make a huge batch of your imfamous peanut noodles and have some greens on the side to add a little extra freshy fresh. As for your wine dilemna, I have two words for you: Black Box. Agreed on Trader Joes and making large batches of food. I literally eat the same thing. every. single day. But it allows me to at least branch out sometimes on the weekend. Also, whenever Living Social or Groupon has a wine deal, I do it. Good tip! I will check it out. This grocery store thing is killing me. Three words: Two. Buck. Chuck.